Green, overflowing gutters aren’t just unsightly – they can allow water to get inside your home, and this water damage is usually followed by huge repair bills! Every year in the UK alone overflowing gutters cause millions of pounds worth of damage and untold upset and disruption whilst repairs are carried out. Don’t take chances with your home – call Pegasus WCS today to unblock, empty and clean your gutters. We can also clean the fascia & soffit board, wash any PVC cladding and restore it all to the sparkling white that you remember! 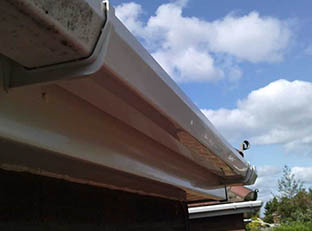 We offer gutter unblocking and cleaning solutions in the Clifton, Redland, Westbury-On-Trym, Sneyd Park, Hotwells, Bristol Harbourside and Clifton Wood areas of Bristol City Centre, and also in the Emersons Green, Mangotsfield, Downend, Frenchay, Fishponds, Stoke Park, Frampton Cottrell and Coalpit Heath areas of South Gloucestershire. Call Pegasus WCS today on 0117 9566962 to find out what we can do for you, or E-mail Us from our contact page! We’re reliable – we won’t let you down. We’re experienced – we know our job inside and out. We’re insured – for our peace of mind as well as yours. We’re local – you know exactly who you’re dealing with. We’re friendly – offering a service with a smile. Gutter Cleaning – In our damp climate, the white PVC on our homes becomes the perfect breeding ground for unsightly green algae and lichen growths. Using our high reach pure water system we can scrub the grime away and reveal the sparkling surface beneath – all without using ladders! Gutter Unblocking – Every year in the UK alone, damage caused by water ingress causes millions of pounds worth of damage. To prevent this happening to you, we offer both a gutter unblocking service AND the option to schedule a 6 monthly gutter check. This ensures that we catch any problems before they cause damage. Cladding Cleaning – Does your home have white PVC cladding that isn’t very white anymore? We can restore this like new in just a few hours – and using our high reach poles we can ever reach cladding around dormer windows without climbing up on the roof! Commercial Gutter Cleaning – Commercial gutters are often much higher and much bigger than domestic ones – but that doesn’t worry us! We have the tools, know-how and experience to tackle almost any sized job. Give us a call today on 0117 9566962 to find out what we can do for you.